Normal convolutional markings seen during a period of rapid brain growth (3 to 7 years). Lacunar Skull. 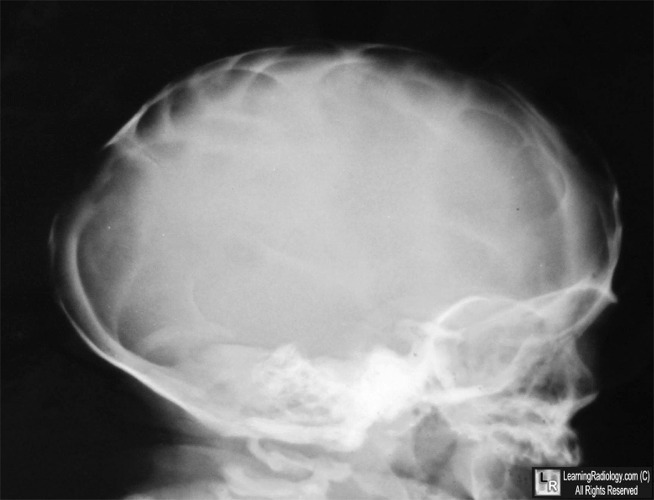 There are multiple focal areas of radiolucency in the skull (white arrows) bounded by more normal, dense bony ridges. The child had a known myelomeningocele. Luckenschadel. This newborn skull is markedly dysplastic with little in the way of normal, dense bony ridges. The Infant Skull: A Vault of Information. RB J Glass, S K Fernbach, KI Norton, PS Choi and TP Naidich. March 2004 RadioGraphics, 24, 507-522.